It's here! The next installment in the World History series of dress up games over at Rin's! 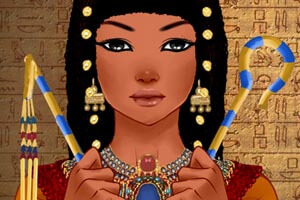 Here we have an Egyptian avatar, fit for a queen or princess, from Nefertiti to Cleopatra. Start your look with exotic Egyptian eyeliner styles, then create a hairstyle featuring lots of hair textures, braids and dreads. Drape yourself in flowing yet structured ancient gowns, and adorn your queen in luxurious golden jewelry, including ornate necklaces and head pieces. Finally, make a bold statement with iconic hand held Egyptian items.